“Tuesday 5th February 2019 was an extraordinary day in the short history of the United Arab Emirates. 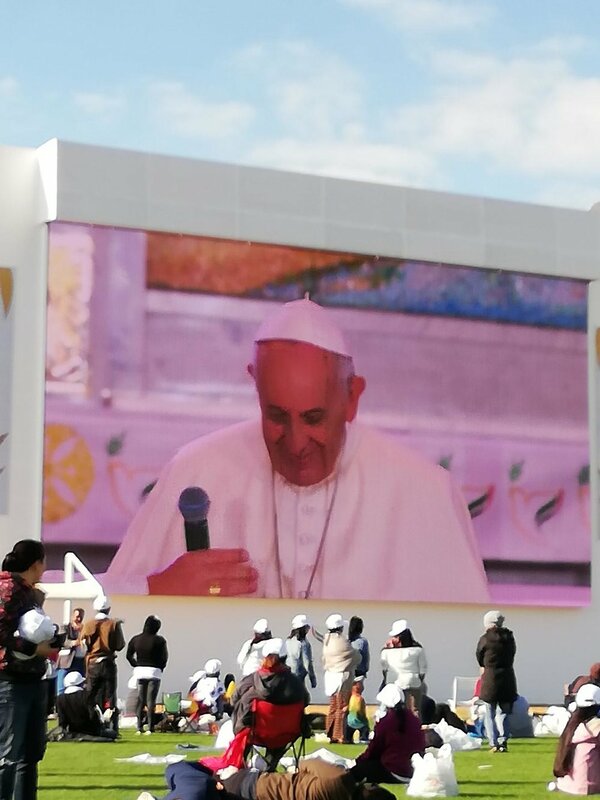 The visit of His Holiness Pope Francis culminated in an open air mass attended by over 170,000 people. Interestingly, the local media here reported that at least 5,000 of those attending were Muslims. This year has been designated as ‘the year of tolerance’ in the UAE and the Papal visit was certainly a high profile event to get things started! In comparison to other Gulf nations, the UAE has a fairly liberal approach to religious tolerance and Christians of all denominations are permitted to practice their faith. However, this is usually restricted to churches and this was the first time that mass had been held in such a public arena. 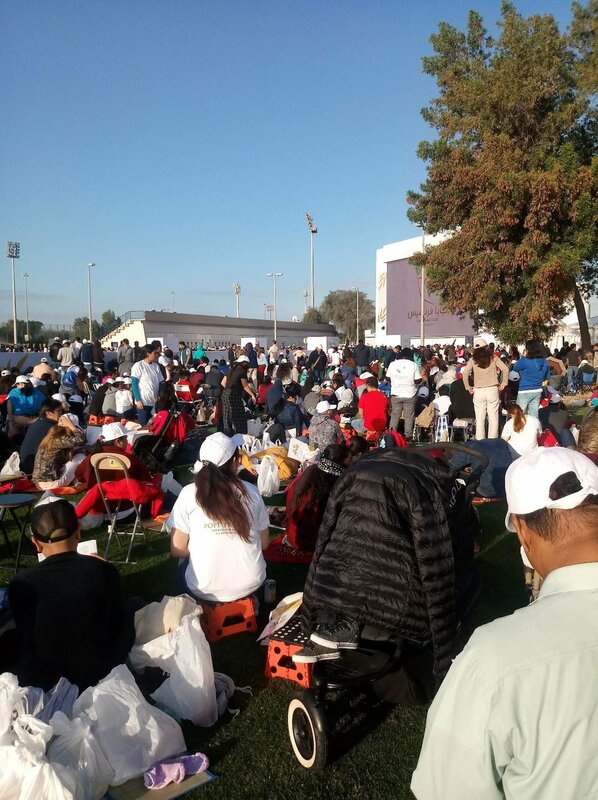 Many of the faithful travelled from other countries as well as the far corners of the UAE and some arrived at the venue at midnight, more than 10 hours before the Holy Father was due to arrive. Such commitment was quite humbling I can tell you. We set off from our home in Dubai at 4.30am for the relatively short drive to Abu Dhabi. We arrived at the stadium just as the sun was beginning to rise. You would be surprised at how cold it can be here in the UAE at this time of year but the huge crowds were cheerful and orderly as we queued to enter the venue. During the long wait we were kept busy by the choirmaster who organized the 50, 000 inside the stadium as well as the 120,000 outside in rehearsing the selected hymns. Then, at 10am, Pope Francis arrived, waving happily from the Pope mobile which made steady progress around the whole area allowing virtually everybody to get a good view of him. The mass itself featured contributions in the many languages of the UAE; English, Arabic, Tagalog, Malayalam and Urdu so there was something for everyone. The gospel could not have been more appropriate; the sermon on the mount! By 12.30pm it was all over and people started to drift away back to normality having been part of an extraordinary, unforgettable event. The Pope left for Rome within hours but his three day visit certainly left an impression. The school where I work, like all schools across the whole UAE, was closed for two days in recognition of the importance of the visit. Muslim friends, colleagues and students have been prompted to ask me questions about my faith which showed a genuine respect and an attempt to find common ground which can only possibly be a good thing. We said a prayer for everyone at St. Joseph’s and I’m pretty sure the Holy Father knew that we were there!